Our skin issues lie much deeper than us being overly obsessive with vanity. The skin is one of the first places to show signs of issues going on within the body, especially when it comes to deficiencies and imbalances. 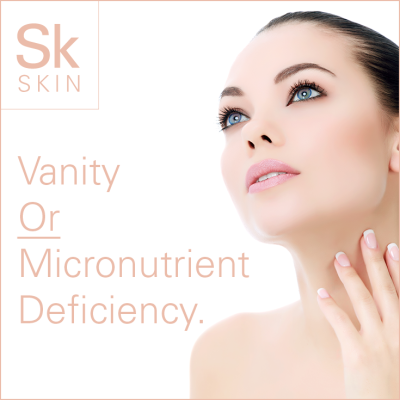 For optimal health and skin that is radiant, micronutrients are vital to making this happen. I bet you didn’t know that almost every single one of us are usually not getting the amounts necessary to reach optimum levels. This results in dry skin, brittle nails and early signs of aging. As if we didn’t have enough problems already. Often we break food down into fats, carbohydrates and proteins especially when it comes to trying to drop excess pounds. These are macronutrients. If you take these macronutrients (fats, carbohydrates and proteins) and break them down further you would find the building blocks of the food – the vitamins, minerals, amino acids and essential fatty acids. These are micronutrients. Micronutrients work as a team and are better absorbed by the body when combined together. Antioxidants are powerful beauty nutrients for the skin that help fight the damage caused by free radicals. Vitamins A, C and E are examples of these powerful anti-oxidants that are essential for renewing and regenerating cells, which are nature’s youth-boosting nutrients to help fight the signs of aging. Vitamin D3 is another micronutrient that helps to regulate the antimicrobial defenses in our skin, and is known to help improve mood once we build up a certain level in our body – an added benefit. Essential fatty acids are essential micronutrients when it comes to the health of our skin. Most skin conditions are more than likely triggered by inflammation. Omega 3s are strong anti-inflammatory nutrients that help to strengthen cell membranes while nourishing and hydrating our cells. Choosing foods that are organic, local, GMO-free, free-range, wild and grass fed will have higher levels of micronutrients than foods that are processed, laden with chemicals and that have travelled long distances to get to your plate. Foods should be eaten soon after picking in order to get the most nutritional value. Fish that is farmed, chickens that are caged and cows that are not given grass to eat will not deliver the same results as the ones that are wild and free to roam. Just like the foods we eat make a difference to us, the foods the animals eat are just as important and beneficial to us. If you eat healthy but are still showing signs of micronutrient deficiencies such as dry skin, brittle hair and nails, and other chronic skin conditions, you may have an issue with absorption. Are you experiencing symptoms such as gas, bloating, constipation, or diarrhea? These are all signs of digestive issues, which can prevent proper nutrient absorption. To support digestion and for better absorption of micronutrients, you may want to consider digestive enzymes and probiotics. If you suspect you have a nutritional deficiency and issues with absorption, consult a functional medicine doctor or a naturopath about getting tested.